The inciting incident is one of the most important plot points in your novel. It also happens to be one of the most confusing – both to define and to create. 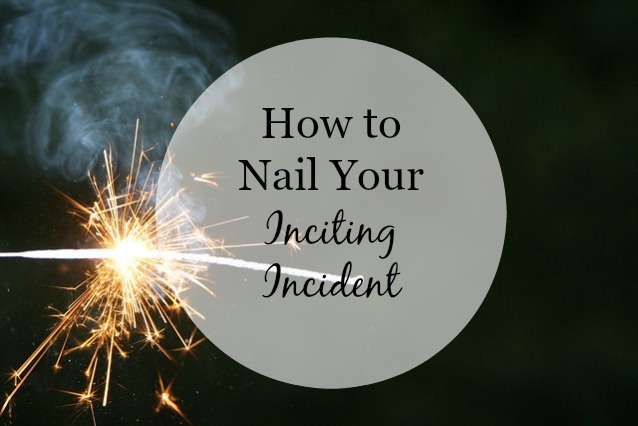 Everyone seems to have a different idea of what the term inciting incident means. The answers vary from person to person, with no clear-cut definition to be found. It’s the first thing that happens in the story. It’s the event that introduces the conflict and gets the plot going. It shows up at the end of the first act. It happens before the story starts. With all these different responses, no wonder writers are so confused. When it comes to understanding the inciting incident, you need to know one thing: it’s not a single event that happens in the story – it’s three different events. Here’s a brief breakdown of each of them below. The Hook. The opening of your story should draw readers in and keep them wanting more. It’s the first thing that happens related to the plot, and sparks interest in the audience. For example, in The Hunger Games, the novel opens with Prim and Katniss preparing for the Reaping. The First Plot Point. This event is what pushes your story ahead. It’s meant to shove your characters headfirst into the conflict. Their world has been forever changed for one reason or another, and now they will have to confront that change. The first plot point usually occurs around the 25% mark. It’s the “doorway of no return” at the end of the first act, not the first eventful moment in your story (unless you have a pacing problem). In The Hunger Games, the first plot point involves Haymitch and Peeta’s scheme to make Katniss more likeable – Peeta tells everyone that he has a crush on the woman who came with him. The Inciting Event. The inciting event can also be thought of as the first act’s turning point. Ideally, it’s placed around the 12% mark, and truly launches the main conflict. This plot point bridges the gap between the hook and the first plot point. Unlike the first plot point, it doesn’t change the characters’ world forever, but it does make them break out in a cold sweat. For Katniss in The Hunger Games, this is volunteering to take her sister’s place and being whisked away for training. While these three points are vital to understanding the concept of the inciting incident, you should also take note of something called the key event. This event forms the other half of the inciting event – think of it as what involves your character in the inciting event. Sound confusing? Let me explain. The Inciting Event (remember: that’s the turning point halfway through the First Act) brings the conflict to the protagonist’s awareness. But the protagonist still won’t fully engaged with the conflict. He may make a half-hearted attempt to resolve it. Or he may try to walk away from it entirely. Until the Key Event. For Katniss, the key event happens when she needs medicine and can only get some from the sponsors. She realizes that her only chance for survival may be to keep up appearances with Peeta, and she commits to putting on a show for everyone. You might still be a little puzzled, but that’s all right. The inciting incident is a difficult concept to grasp. If you want to practice identifying these events, try locating them in your favorite books. How do you think of the inciting incident? What are the important events in your works-in-progress? Feel free to share them in the comments below. Briana Morgan is a young adult horror and fantasy author, playwright, freelance writer, editor, and writing coach. She and her cat live in Atlanta, Georgia.